After several days of heating and cooling in the pot, the colors are more saturated but also duller. Did I overheat it? Or is the difference due to the different cameras used to take these pictures. (#2 was taken with my iPhone, this was with my Canon Point & Shoot.) I also did not take the skeins out and squeeze out all the water. I will be patient. It’s not my best suit, but I am committed to letting this sit in the dye pot for a full week. 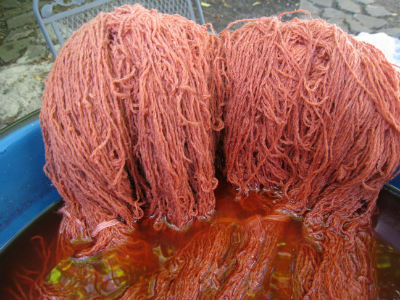 There is still color in the dye bath.